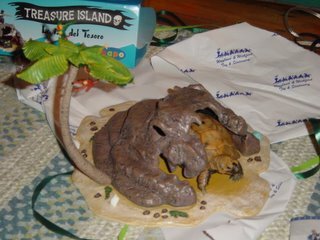 I haven't been completely bedridden though, I was able to join in the birthday festivities for my housemate's turtle Filbert. 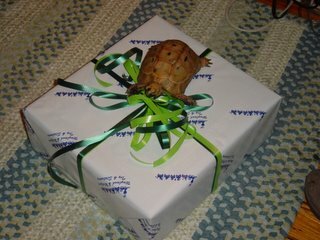 Filbert's friend J bought him a hideaway. Starting Monday I am going on my insane interview trip for grad school. Since I am a major procrastinator, I finally got around to getting my hair cut, trying on my suit (with my cast), and deciding if I had shoes that would work with the suit. Luckily, my suit works with cast (I don't need to fix the jacket or anything), plus Filene's was having a massive shoe sale and I bought two pairs of ankle boots for under $50. My haircut was pretty cool too. 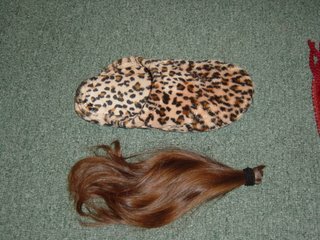 The cut wasn't too exciting, but check out how much hair that got cut off! Ten inches! He cut off ten inches of hair! I tried weighing it on my scale but it didn't register. That was slightly disappointing considering once the hair was cut it felt like I had lost five pounds. In knitting news, I have done nothing but look at pattern books. 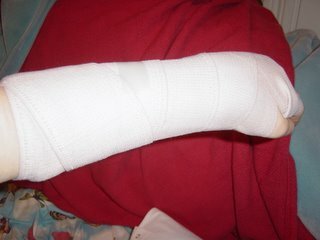 I tried to cast on my Olympic socks and my wrist began to throb. I took that as a sign and stopped. My cast comes off in three weeks and I shall have more exciting knitting news then. I was having a great Tuesday, nothing special, but it was a fine day. 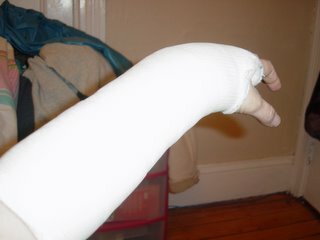 When I was leaving a grad seminar I was taking, I slipped on the stairs (no salt) and broke my wrist. 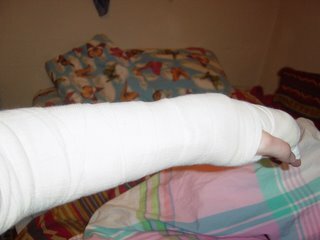 I ended up in the ER and my arm was put in a splint. In better news a got ANOTHER grad school interview! I did my interview at the University of Buffalo already and I have interviews set up at the University of Florida, Binghamton University, and American University! Hurrah!